to my shame i own the board since month, but didn't build it in since now. Today i wanted to start and took the Manual for the upgrade, but than i realised that the board on the picture looks totaly diffrent to mine. Ok, maybe i should open my voyager first and should have a look, but the board in the manula is much bibber than mine. If you have a look, you can see that board is screwed up with three srews on the length, mine have only two, also the plugs are in an other order. Mybe i should give itt a try and open it, but i am bit afraid, that some of the cables are to short or something like that. It is a REV4 board. Are there diffrent layouts of the board? Is it ok like that? 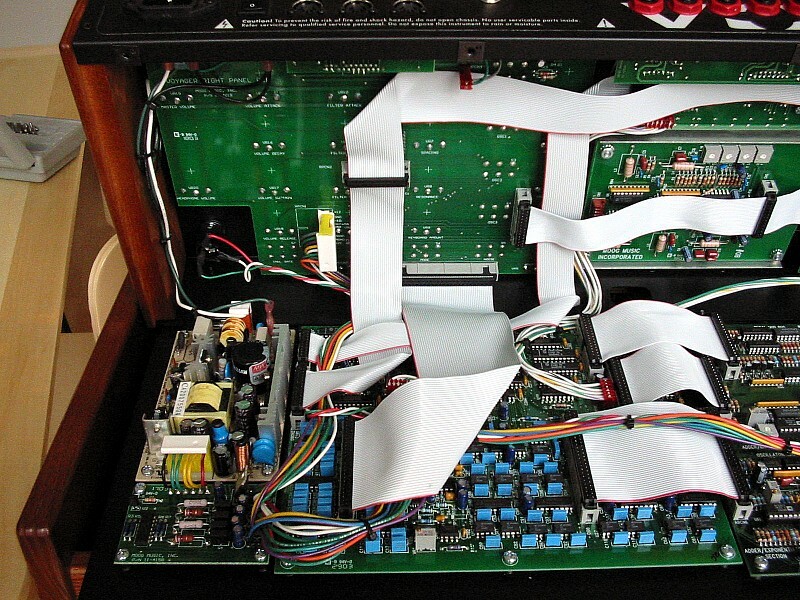 The so called 3.0 hardware upgrade include a newer digital board version. It is not build like the old board. The old digital board had pins (of the electric components) inserted through holes of the board and then soldered from the other side. But this is now not the way boards are build. I think this is also due to the bann of lead for soldering. 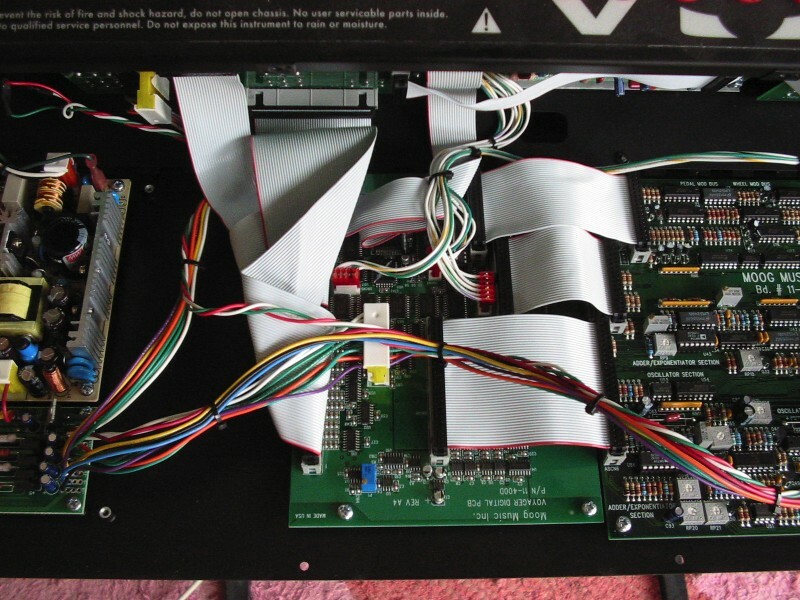 So newer boards, not only found inside the Voyager, have so called SMD compnents. These are not pushed through drilled holes of the board, but somehow soldered on top of the board traces. So just follow the original Moog instructions. And don't mind the board being a bit smaller. Thanks for taking time to post those pictures...really interesting! What about the VR1 trimmer on the new digital SMD PCB? The 3.0 hardware upgrade manual describes the +/- 1.6 Volt callibration procedure after installing the board by turning a trimmer called VR1. The new small digital board doesn't have VR1. What to do?! I opened my Voyager for the first time to install the VX-351 adapter. I have the old (long) board. And....I had the 3.0 hardware update. So I guess that they modified the board with more RAM. A hell of a lot cheaper for Moog I assume even though I was charged the same price. Oh well. It will be a lot easier to replace a component if I ever need to with the thru hole mounting as opposed to the surface mount. on the other hand, the production of through hole components will stop most likely in the next years. If there are no through hole components being used by manufactures (due to the leed free soldering rules), then there is no big market for the old components anymore. And the manufactures don't care for so few synth freaks. I didn't look but I assume these are common off the shelf parts. Having repaired my Memorymoog recently and stocking up on ICs I suspect there will be a supply of dual in line parts around for quite some time. Of course there are certain parts that are difficult if not impossible to get (CEMs). Thank you for this post. It's now 2016 and I got a replacement board only to be horrified that it looks different! I put the smaller board in my 50th Anniversary Voyager and it fits fine. I was surprised as you were but all the cables reach and the mounting holes so it’s all great. My Voyager has been working great.